With Code of the Duelist just a few weeks away, let’s set the stage for the debut of the latest Dueling sensations to hit the Yu-Gi-Oh! TRADING CARD GAME. Now presenting: the Trickstars! The ideal opening act for the Trickstar Deck is Trickstar Candina. She has 1800 ATK and when she’s Normal Summoned, you can add any card with Trickstar in its name from your Deck to hand. Candina can start off your combos by adding a missing combo piece to your hand. You can read on to see what the other Trickstar cards do, but all of them are enabled by just starting out with Trickstar Candina. While Trickstar Lycoris is in your hand, you can use her effect to Special Summon her and return another Trickstar that isn’t Lycoris back to your hand. Starting off with Candina is an easy way to setup a Lycoris and have Candina ready for next turn! When your opponent adds a card to their hand for any reason (drawing, add from Deck to hand, add from Graveyard to hand… anything) Trickstar Lycoris deals 200 damage to your opponent. Many strategies depend on drawing cards and adding specific cards to hand from card effects. Lycroris’s effect will punish your opponent for doing what their Deck is designed to do, putting them on a clock that will force them to deal with Lycoris first and foremost. You can also use Trickstar Candina to add Trickstar Lilybell to your hand, which is also how you can trigger Lilybell’s effect to Special Summon her to your hand! Lilybell’s other effect lets her attack directly, and when she inflicts battle damage, you can add a Trickstar monster from your Graveyard back to your hand. 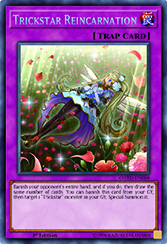 Adding back either Trickstar Candina or Trickstar Lycoris is excellent because Lycoris can jump back to the field right away, and Candina can add another Trickstar card to your hand with her effect. Sadly, that’s all of the Trickstar monsters available in the Main Deck right now, so even running a full set of each, that’s only nine cards. Luckily, you can see a Trickstar monster with six additional cards if you also include three copies of Terraforming and three copies of the Field Spell Trickstar Light Stage! When you activate Trickstar Light Stage, you can add any Trickstar monster from your Deck to your hand – this should sound familiar if you’ve previously used Union Hangar. The Trickstar Field Spell also has a unique effect that can lockdown your opponent’s Set Spell/Traps. Once per turn, you can target a Set Spell/Trap and it can’t be activated until the End Phase, at which point your opponent has to either activate it or send it to the Graveyard. Your opponent can chain the target to Light Stage’s effect if they want, but if they don’t, the Set card will be stuck face-down until the End Phase while Light Stage remains face-up on the field. And just to rub it in, if a Trickstar monster inflicts battle or effect damage to your opponent, the Field Spell adds another 200 damage afterwards. This can add up over time so it’ll definitely bring your opponent a few turns closer to defeat! 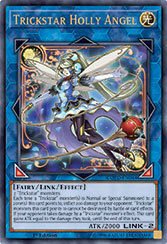 The Trickstar Trap Card, Trickstar Reincarnation is an incredibly potent disruption effect. Your opponent banishes their entire hand then they draw that many cards. If your opponent has added specific cards to their hand to forward their strategy, you can permanently get rid of those cards with just a simple Trap effect! If you have Trickstar Lycoris out, you can also deal damage for each card they draw! If Trickstar Reincarnation is in your Graveyard, you can banish it to Special Summon a Trickstar from your Graveyard! There are no “except during the turn it was sent to the Graveyard” or “you can only do this once per turn” restrictions; if it’s in your Graveyard, you can do it! 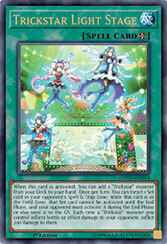 Finally, with Code of the Duelist full of Link Monsters, it makes sense for Trickstars to have a Link Monster of their own: Trickstar Holly Angel is a Link 2 and requires 2 Trickstar Monsters – easy to pull off if you use Candina’s effect to find Lilybell. Its Link Arrows point down-left and down-right which perfectly lines up with her effect. If a Trickstar monster is Normal or Special Summoned to a zone she points to, she deals 200 damage to your opponent, and the monsters in the zones she points to can’t be destroyed by battle or card effects. She starts off at 2000 ATK but she also gains ATK equal to the effect damage your Trickstar monsters inflict – including her own – making her the perfect game ender! You can find the Trickstars performing at the Code of the Duelist Sneak Peek on July 29th/30th at Forbidden Power! Check out our events page for more info!